If you’re looking to invest in glass railings then there are a few things that you need to take into consideration. These gorgeous railings are heavy duty and can withstand the elements. They’re strong and can easily be taken care of. Once they’re installed they will raise the cost and visual appeal of your area! 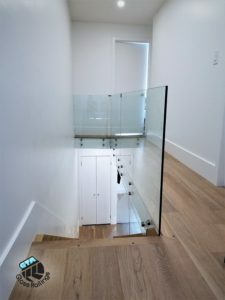 The best way to get an estimate on the cost of installing glass railings is to call a professional. The price can vary depending on the length of the railing as well as the type of post, number of connectors, how many stairs, and the number of corners included. Posts types vary from wood to stainless steel invisible posts. The more corners created will increase the price, as will the number of stairs. A shorter, straight glass railing will be cheaper than one with multiple corners that goes up a flight of stairs. Railings can be as personalized as you want them to be. They can range from modern in an upscale restaurant, to being more traditional at your home or at a park. With many kinds of accents to choose from, you can really make your glass railings your own. Metal and wood accents can change the look and style of a railing, and investing in clear posts will allow you to create an even more contemporary look. No matter where you want to put your glass railings – inside along a staircase or balcony, or outside on a deck or by a water feature, you can rest assured that its installation will increase your property value and make your whole area even more lovely. Investing in your home or property this way is a great way to keep people safe while keeping the safety features as attractive as possible. Railing can be used inside or outside. They work on staircases, along balconies, or even to line a terrace. They’re easy to clean with a simple wipe-down, and don’t require much more maintenance than that. When you’ve worked hard to beautify your backyard, then it’s nice to show it off with some glass railings that won’t obstruct your view. They’re especially nice around a pool so that it remains a part of your yard and isn’t shut off from the rest of the activity by a fence that you can’t see through.